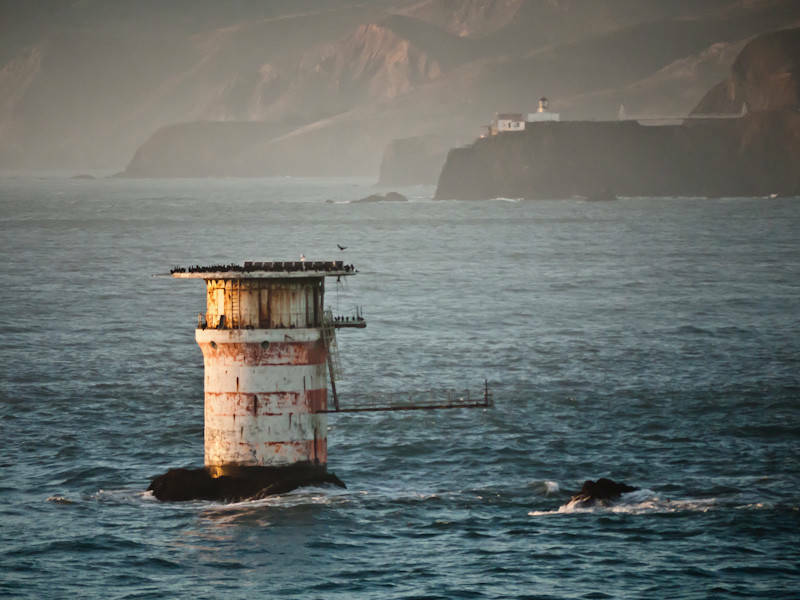 As a major shipping port, the Bay Area has a lot of lighthouses to help with navigation, but there’s one lighthouse that looks quite different from the rest: Mile Rocks. Instead of a tall tower, it’s a short, white cylinder with a helipad on top of it. And instead of sitting on a coastline, it sits on top of a rock in the water on the southwest side of the Golden Gate Bridge, not far from Lands End in San Francisco. Bay Curious listener Jeremy Johnstone didn’t pay much attention to this helipad until he saw something peculiar there one day around 30 years ago. 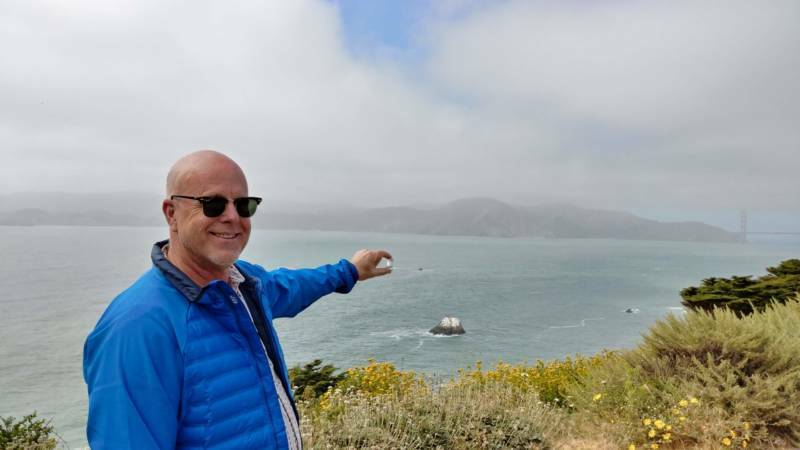 “I was with friends below the Legion of Honor walking on the golf course, and we noticed a Coast Guard helicopter hovering over the Mile Rocks Lighthouse,” he said. Johnstone thought it was strange that the helicopter wasn’t trying to land on the helipad, so he kept on watching. Johnstone thought the site was defunct, but he’d just witnessed what looked like some sort of "Mission: Impossible" operation. It made him wonder about the history of the site and if there were any lighthouse keepers still working there. The waters around Mile Rocks are some of the most dangerous in the bay. “[It] was an area in which there were many, many shipwrecks, dozens of shipwrecks,” says maritime historian Ralph Shanks. He says the 1901 crash of the Rio de Janeiro passenger ship was the wreck that provided a somber wake-up call. The pilot and captain got confused trying to navigate through heavy fog in the bay, struck an underwater ledge and sank in about 8 minutes. 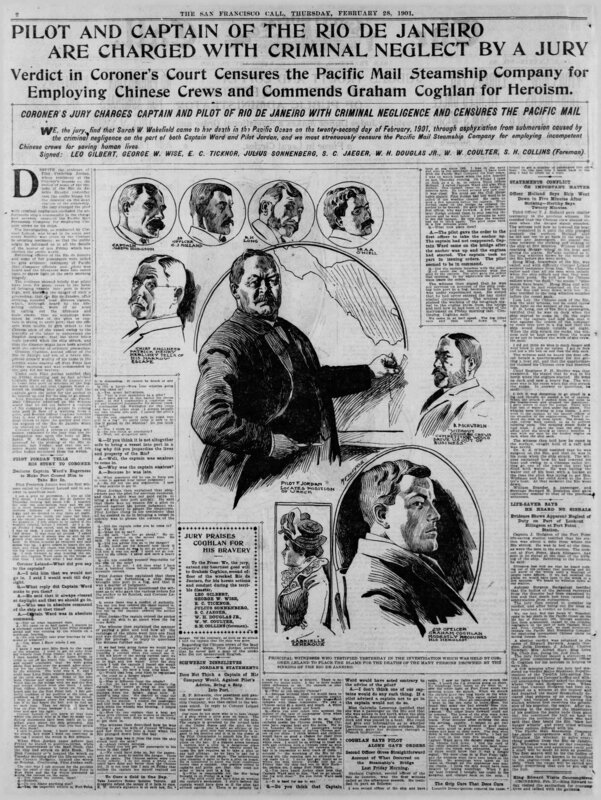 More than 100 lives were lost, and soon after the wreck, Congress approved funding for a lighthouse on Mile Rocks. But building on the site wasn’t easy. “The rocks out there could be wave swept," Shanks said. "It was easy to get washed off. It's treacherous out there." The first construction crew hired by contractor James McMahon took one look at the site and refused to work. They didn’t think it was worth risking their own lives to build the lighthouse. So McMahon went to San Francisco’s wharf and hired sailors who were used to working on the ocean. The final structure ended up being 85 feet tall with three tiers in decreasing sizes, topped by a lantern room. Lighthouse keepers who staffed it had to keep the lantern lens clean, run the foghorn and report the weather. There wasn’t a lot of space inside, and because it was so remote, the United States Lighthouse Board made it a “stag” station, meaning only men could work there. “That was hard for the families because most of the keepers were married, and so their families had to live ashore. Some lived close by in San Francisco. Some would live quite a ways away,” Shanks said. He says a typical shift was two weeks on and one week off. To adjust, lighthouse keepers found creative ways to stay in touch with their loved ones. “One couple, the wife would walk out to Lands End in San Francisco, and she would walk her dog and carry a light, and each time in the evening, she would go out and flash her light, and he would flash a light on the lighthouse and they would signal each other to say ‘Good night,' " Shanks said. In addition to the lighthouse being remote, it was scary to work there, too. Eventually the Coast Guard decided it was too dangerous and too expensive to have people working at Mile Rocks. So in the 1960s, it developed plans to automate the lighthouse. But the plans included more than just eliminating the lighthouse keeper. 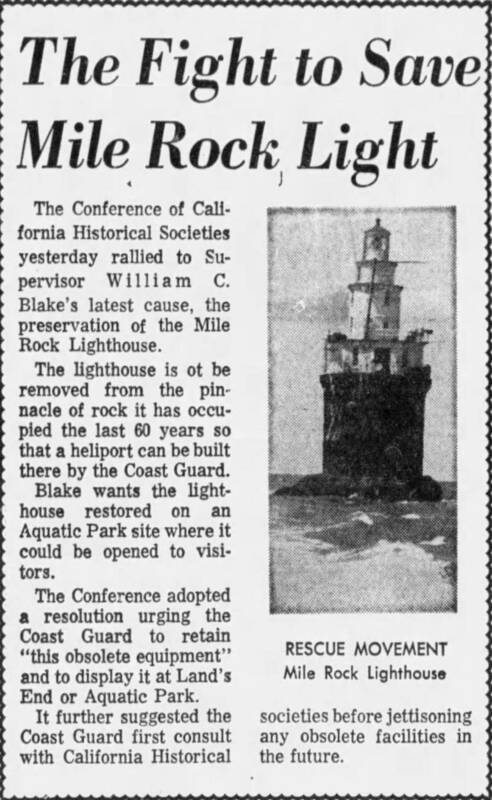 “The Coast Guard had people in the service who wanted to convert Mile Rocks from being a beautiful lighthouse to being a flat platform in which helicopters could be landed on it,” Shanks said. The Coast Guard wanted to remove the upper two tiers and the lantern room of the lighthouse and then create a helipad on the lowest tier. The cost-saving plan sparked massive public protest. San Francisco Supervisor William Blake, who had a maritime background, and the Conference of California Historical Societies led the effort to prevent the transformation. 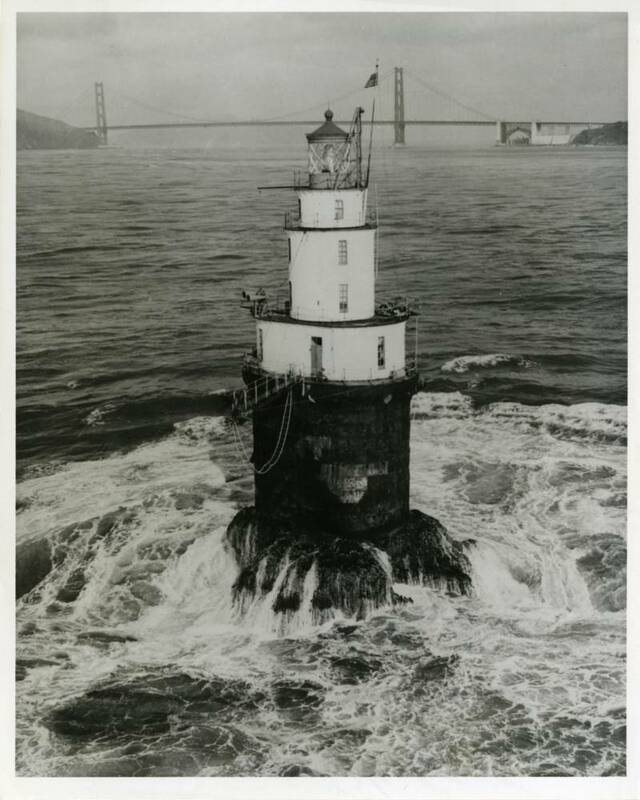 “All these different people tried to stop that conversion because this was the most spectacular lighthouse, really, in San Francisco Bay,” Shanks said. 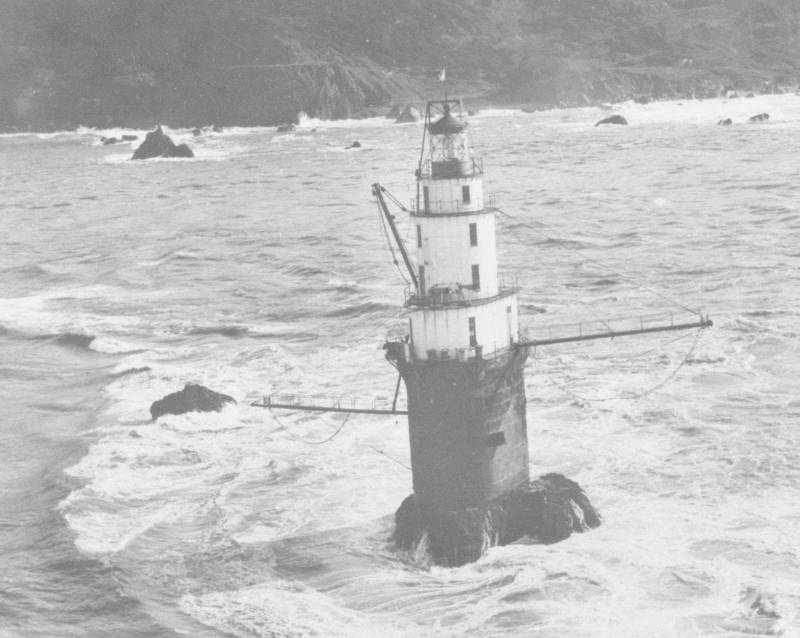 “But the Coast Guard was committed to its plan, and they cut the top portion of the lighthouse off, destroying the structure as far as beauty goes." The last lighthouse keepers left Mile Rocks in the summer of 1965. 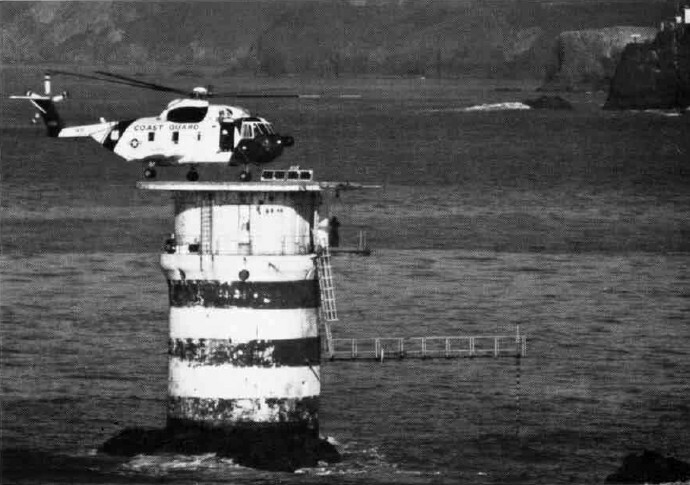 It was closed for a few months while the Coast Guard took off the top tiers and installed the helipad. The lighthouse soon reopened as a fully automated station. Since then, many of the things a lighthouse keeper would’ve done have been done machines. The Coast Guard still makes regular maintenance trips there by helicopter, and that’s probably what Johnstone saw 30 years ago — not some cool Tom Cruise caper. But strong winds at the site still make those maintenance trips quite dangerous, and keeping ships safe despite the danger is very cool.